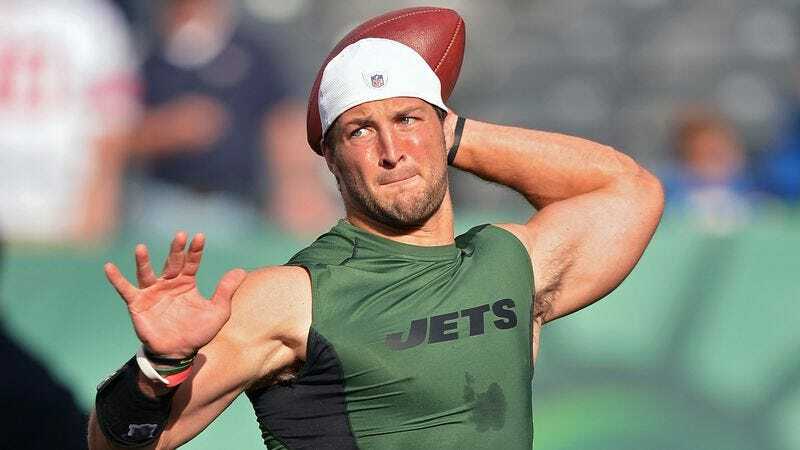 NEW YORK—Contradicting statements made last year, New York Jets general manager John Idzik announced Monday that the team is still interested in keeping Tim Tebow on the roster as a much-needed excuse for next season’s struggles. “In terms of being a scapegoat, we’ve never denied Tim’s effectiveness,” said Idzik, even suggesting that both Tebow and Mark Sanchez could return to split time as a major media distraction. “We relied heavily on Tebow every game last year, and we think he could be our fall guy again. But don’t get me wrong, we’re considering all our options when it comes to finding players we can pin all our problems on. As you saw, we just worked out David Garrard last week, who has years of scapegoat experience.” Idzik told reporters that the Jets will also consider platooning several overpriced free agents and high draft picks as scapegoat.